Battlefield 1 is a historical-military first-person shooter developed by DICE and published by EA Games for the Xbox One, PlayStation 4, and PC on October 21, 2016. 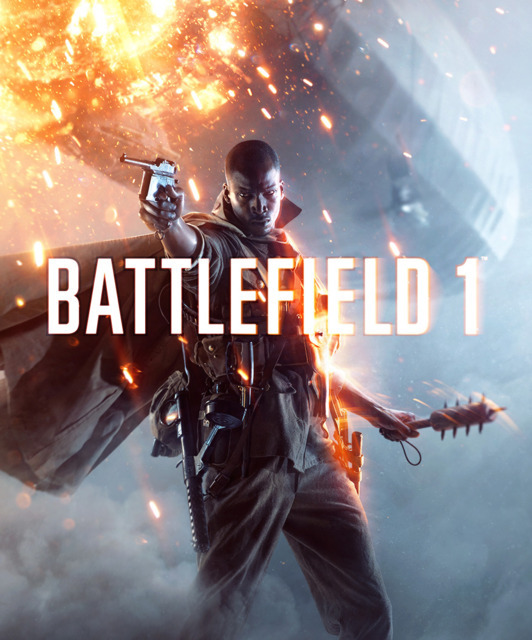 Despite the naming convention, Battlefield 1 is the fifteenth installment of the long-running Battlefield series. It brings the series back to the early 20th century, this time during World War I (the first AAA first-person shooter to do so). Unlike previous entries in the series, the game's single-player story is not focused on a particular character or squad and, like early Call of Duty games, puts the player into the role of several different Allied soldiers throughout the world. Also new to the series is the Operations mode, a more narrative-driven experience that takes place across several maps. Operations campaigns are based on real battles of World War I, and task an attacking team with capturing every sector on every map in the campaign. The defenders must exhaust all of the attackers' reinforcements to win the match. In each campaign the attacking team has three batallions, or attempts, to win the match. The British Empire committed millions of men to the war, including many from British colonies. As a dominant naval power and Germany's primary opponent in the air, the British played a significant role in all aspects of the Great War and were the first nation to use tanks in battle. Many facets of the war, including the disastrous Battle of the Somme and the alleged incompetency of the generals, left a lasting impact on Britain. Germany, as it would again in the 1940s, fought a two front war against the Allies. As one of the nations at the forefront of the Western Front, Germany took part in iconic battles, including the Battle of Verdun and the Battle of the Somme. Germany pioneered many technologies and strategies during the war, including the first full-scale deployment of chemical weapons and unrestricted submarine warfare. The Germans nearly won the war in 1918 with a massive Spring Offensive, but fatigue and strained supply lines put a stop to the push. The German population suffered greatly in the later stages of the war as a result of a British blockade that continued into the summer of 1919. For two and a half years the United States remained militarily neutral in the Great War while contributing supplies to the Allies. In 1917, as the British and French struggled to continue the war after two years of brutal fighting and the Russian Empire began collapsing into civil war, the Americans were finally brought into the conflict when Germany's submarine warfare began hitting American ships. This boost in fresh manpower gave the Allies an edge in the final months of the war. France suffered the second highest Allied casualty rate in the war, after Russia. The French were instrumental in holding the Germans along the Western Front, though by 1917 were beginning to experience mutinies as a result of tremendous war weariness. However, their victory in the Second Battle of the Marne would kick off the string of victories that led to an Allied victory. The Ottoman Empire achieved early victories in the war, winning important battles against the Russians and the British. It was during the Great War that the Ottoman government orchestrated the Armenian genocide, and the Central Powers' defeat in 1918 directly led to the collapse of the Ottoman Empire in 1921. Italy occupied a unique space during the war, doing battle against the Austro-Hungarians in the mountainous terrain of the Alps and the surrounding region. The Italians suffered defeats after Russia ducked out of the war and the Central Powers consolidated its Eastern Front forces against them, but were able to regroup and win the decisive Battle of Vittoria Veneto in 1918. Austria-Hungary in the Great War represented the final stage of life for the centuries-old Habsburg Empire, which saw its official end at the conclusion of the conflict. Austria-Hungary was the first state to declare war, doing so against Serbia after Archduke Franz Ferdinand was assassinated. The Austro-Hungarians fought the Italians in the mountains and the Russians along the Eastern Front. The Russian Empire suffered the greatest number of casualties in the war and were so badly affected by the conflict that the nation descended into civil war in 1917, ducking out of the conflict before its end. One of the most storied aspects involves Tsar Nicholas II and his family's dealings with Grigori Rasputin. Nicholas II and his family were assassinated on July 17, 1918 by Bolshevik revolutionaries. Beyond the Marne Soissons, Rupture The French Army attacks German positions with a fleet of tanks during the Second Battle of the Marne in 1918. Brusilov Offensive Galicia, Brusilov Keep The Russian Army brings the fight to the Austro-Hungarian Empire during the titular offensive in 1916. Conquer Hell Ballroom Blitz, Argonne Forest The United States enters the war and launches an offensive against the Germans in the Meuse-Argonne region. Devil's Anvil Verdun Heights, Fort de Vaux The German Empire attempts to crush French morale in the Battle of Verdun in 1916. Gallipoli Cape Helles, Achi Baba The British Empire launches the ill-fated Gallipoli Campaign against the Ottoman Empire. Iron Walls Monte Grappa, Empire's Edge The Kingdom of Italy attemps to defeat the Austro-Hungarian Empire in the mountains and hills of the Italian Front. Kaiserschlacht St. Quentin Scar, Amiens The German Empire launches the massive Spring Offensive of 1918 against the British. Oil of Empires Fao Fortress, Suez, Sinai Desert The longest Operation, based on the British quest for oil in the Middle East. Red Tide Volga River, Tsaritsyn The Russian Civil War pits the new communist Red Army against the imperial White Army in a battle for the future of Russia. The first expansion introduces the French Army to Battlefield 1, with six new maps based on the fighting between the French and the Germans along the Western Front. It also brings with it six new weapons, three new vehicles, and six new melee weapons. The second expansion introduces the Russians to Battlefield 1, with six maps focusing on their battles against the German and Austro-Hungarian Empires, as well as the Russian Civil War. The expansion also includes eleven new weapons, four new vehicles, and three new melee weapons. The third expansion brings new naval-focused battles to Battlefield 1 as well as the Gallipoli Campaign. There are four new maps, six new weapons, two new vehicles, and four new melee weapons. The final expansion for Battlefield 1 sees the Italian Campaign to its conclusion and brings in two of the most famous battles of the war. The expansion features three new maps, seven new weapons, two new vehicles, and three new melee weapons. In addition, the expansion adds a new AA rocket gun to the Assault class and sees the return of the dogfighting mode from previous games, with two maps exclusive to the mode. Livens Projector: a series of mortar launchers connected to a plunger that fire gas canisters when activated. These are found on the three infantry maps of the expansion.